If you have not read anything on literary criticism, this little book, An Experiment in Criticism, by C.S. 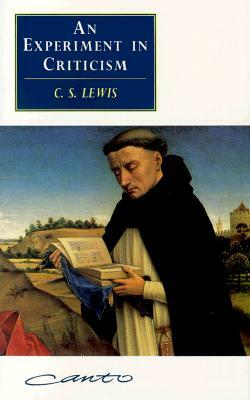 Lewis will open your mind to a whole new world — the world of the text and it well-read. Rather than judging the quality of a books by their composition or content, Lewis suggests one should judge them by the nature or way in which they are read. For example, some people read books only once to gratify some curiosity or lust, only to abandon them forever afterwards. Contrarily, those who truly love their books will read them countless times and cherish them as favored possessions. In other words, bad readers read books seeking only to find a world they already are comfortable with and understand; a world they already have categories for and can explain. A world that “makes sense” in their system of thought. By reading books in such a way, these readers are not challenged by what they read. And in the end, book after book, they meet only themselves. For Lewis, this explains the vast hoard of trashy novels which follow the same basic principle. In these case, the reader is never brought to a higher level of knowledge. There is no additive transfer. Such readers only get out what they already knew. This all takes very little effort on the part of the reader. On the other hand, good readers begin by getting themselves “out of the way.” Good readers will first surrender their own preconceived notions and biases. They open themselves up to receive “instructions” (as it were) from the text itself. In effect, they surrender to the text. And now the text can actually begin to work on the reader. This is an entirely different kind of reading and leads to an additive gain in knowledge on the part of the reader. Rather than meeting only themselves in a text (and learning only what they already knew and had categories for), good readers open themselves up to a whole new world. By “receiving” the text a reader actually meets ‘someone else’ (as it were) and thus grow in the process. All of this is written in Lewis’ classic and beloved, easy style. Taking things ordinarily complex, he makes them simple. I could not recommend this little gem more highly!